The Sub-Committee constituted by the Drugs Consultative Committee (DCC) to examine the issue relating to online sale of drugs has submitted its report. • Creation of a National Portal to act as the nodal platform for transacting and monitoring online sale of drugs. • Necessity of evolving a mechanism to register e-pharmacies. • Geographical restrictions for operation of e-pharmacies. • Mechanism for verification of authenticity through a link to the National Portal. • Existing licensees carrying out retail sale of drugs would also be able to register on the National Portal for carrying out online sale of drugs. • Requirement of registration with CDSCO under the Drugs and Cosmetics Rules, 1945. • certain categories of drugs viz. 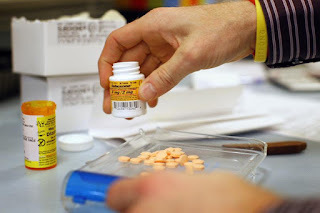 the Narcotic and Psychotropic drugs, tranquilizers, habit forming drugs and Schedule X drugs that are prone to being abused or misused are to be excluded from sale through e-pharmacies. The Sub-committee had sought suggestions/comments from stakeholders and also heard the representatives of industry, associations, NGOs, etc. before preparing the report. Under the provisions of Drugs and Cosmetics Act, 1940 and Rules, 1945 thereunder, the drugs included in Schedule H, H1 and X are required to be sold by retail on, and in accordance with, the prescription of a Registered Medical Practitioner (RMP) only and it is dangerous to take drugs included in Schedule G except under medical supervision. In case of non-compliance with the provisions, the State Licensing Authorities are empowered to take action under the said Act and Rules. The Minister of State (Health and Family Welfare), Sh Faggan Singh Kulaste stated this in a written reply in the Lok Sabha here today.